A family history of varicose veins and older age increase one’s tendency to develop varicose and spider veins. 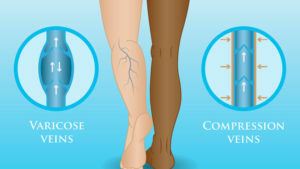 Assured Health physiotherapy offers Graduated Compression stockings in different Ratios (15-20mmhg, 20-30mmhg, 30-40mmhg) to prevent the progression of Venous disease (disease of the veins). Also, in some cases, maintaining a normal weight, and regular exercise may be beneficial.